National Ice Cream Day doesn't arrive until the middle of next month, but it turns out you can get your hands on some free ice cream right now, thanks to a new deal from Dairy Queen. As part of a new summer promotion launched this week, the ubiquitous royal soft serve purveyor is handing out free Blizzards. To remind everyone that it has a mobile app, Dairy Queen will give you a free small Blizzard if you download the app and sign up for an account. Once you've registered, you'll receive a digital coupon via the app for the free ice cream treat that's redeemable at most Dairy Queen locations across the United States (you may want to call your local outpost to double check, though) except for those in Texas (sorry). 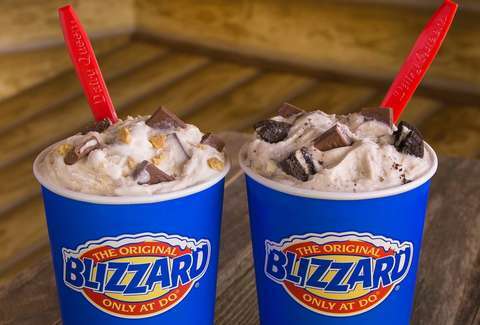 DQ doesn't say if the freebie is restricted to certain flavors, so presumably, you can try the latest limited-edition Blizzards such as S'mores, Cotton Candy, Summer Berry Cheesecake, and Jurassic Chomp With Peanut Butter. The coupon is good for just one Blizzard per person, but Dairy Queen said there's plenty more free ice cream where that came from. Downloading the app and registering an account will get you exclusive access to additional deals on ice cream and food, the company said. All said, if you were planning to eat as much soft serve ice cream as possible this summer anyway without getting any discounts, now would be a good time to change that. Tony Merevick is Senior News Editor at Thrillist and has been on an ice cream kick lately. Send news tips to news@thrillist.com and follow him on Twitter @tonymerevick.